An artist's impression of the development released at the time of the masterplan in 2014. 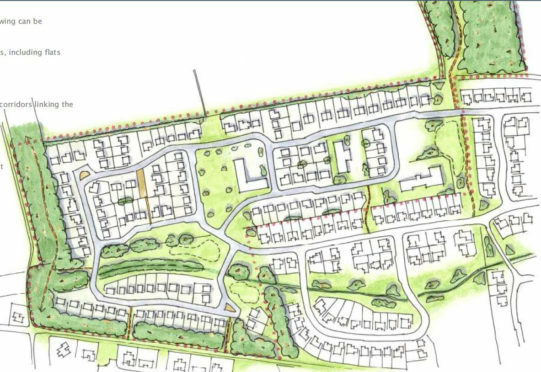 Proposals for hundreds of houses, a care home and a nursery for Aboyne could soon become a reality, despite scores of objections. The scheme, which has been put forward by Deeside housebuilder, AJC Homes, would be built on land to the west of Aboyne Castle. The plans will be discussed by the Marr area committee on Tuesday, with officers recommending that councillors back the scheme. If it is approved, it will go to the infrastructure services committee for a final decision. The proposals consist of 129 houses, 38 flats, a 42-bed care home, a nursery and commercial units. The overall scheme has been on the table since 2009, with a masterplan for the site originally approved in 2014. This development would be the next phase of the existing Castle Park estate, with 47 homes already constructed. A number of people have objected to the plans for reasons ranging from concerns over the local school capacity to the impact on public services. A letter from Darroch Woods Residents Assocation (DWRA), whose homes border the development site, is available on Aberdeenshire Council’s website. It states: “There is a growing unease within the Aboyne community at the extent to which local facilities, not least medical and educational services, are becoming overwhelmed as the village expands. Meanwhile, Mid Deeside Community Council has also objected to the proposals. A letter adds: “The increased volume of traffic gives rise to safety issues and increased noise pollution. The suggested addition of an access directly from the A93 has merit and may consequently improve safety and traffic issues on the A93.